The Barcelona High Performance Training Program offers an intensive summer camp for male and female student athletes from 6 to 21 years old. This program is intense and only suitable for serious athletes. The camp’s coaches are all highly qualified and training is dedicated to improving the players’ technical precision. It is highly football centric and there is little time for other activities. During the month of July, we will have a supervisor from Ertheo at this camp to assist with any issue/emergency. The Barcelona Academy is a professional establishment which specializes in training talented student athletes to fulfill their potential and eventually play in the first or second divisions of Europe’s top leagues. This is a distinguished program as a result of its professional nature and its demanding and intensive program. On average, 30 of the academy’s students per year are offered contracts with first division European teams. 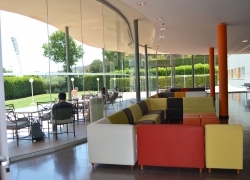 Participants will stay in a high-quality residence, situated only 10 minutes walking distance from the academy. The rooms are quadruples and include a private bathroom. Here young people from all over the world share a living space, and this diversity enriches the overall experience on a cultural level in addition to athletics. The instructors are very experienced. The activities are great. The training is effective, but more effort is needed for those kids who only speak French, so they can understand everything perfectly. Other than that it was great. Overall, our son was very happy with the camp. He has great memories. Very well organized. My son is very happy. This has been a great personal experience. The trainers are very professional. The intense training is great. Bravo. This program is very demanding in nature. Athletes spend most of their time attending different training sessions. Training starts at 9:00 AM and continues until 5:00 PM or 6:00 PM making it suitable for only the most highly skilled, physically fit athletes. 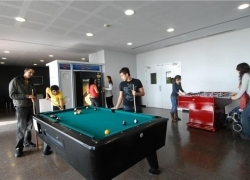 The Barcelona High Performance Academy is also dedicated to instilling values in its students. The camp’s unique training program is designed to maximize the players’ progress far beyond the technical aspects of the sport. To optimize progress over a short period of time, coaches frequently individually evaluate players and point out their personal strengths and weaknesses. Coaches place athletes in small groups based on skill level so they can set proper attainable yet challenging goals for the athletes. How do coaches do this? They challenge the athletes with drills that are slightly above the current skill level of the athletes while at the same time instructing them through the drills and encouraging their effort. Once again, this academy is extremely football centric but is also dedicated to teaching its students values such as sacrifice, work ethic, and respect. The academy’s mission is to develop intelligent football players who, as a result of their football skills and/or the values they learned at the academy, have very high chances of being successful. Participants attend practical and theoretical training sessions until around 7:00 PM every day. 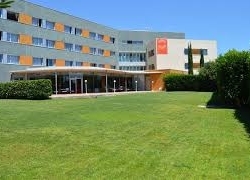 After training, they have time to relax, socialize, catch up with their families, or enjoy the facilities of the residence. The program is highly football centric and there is little time for other activities. As such, it is perfect for serious athletes who want to dedicate themselves to football professionally. Nevertheless, the camp does offer some non-football related activities for participants. For example, students 14 years old and over attend daily activities in the swimming pool. Therefore, participants 14 years old and over should bring bathing gear, flip-flops, and a towel. The athletes that participate in the camp will be lodged at the Ágora residence, situated only 900 meters from the academy. The rooms are quadruples (two bunk beds), and have two closets, a bathroom, two desks, shelves and desk lamps. The residence has a towel and bed linen change service, as well as a housekeeping service. The academy has several artificial turf fields and one natural grass field. It also has a gym with a pool for any additional training outside of what the camp schedule provides. In addition, the academy has its own medical services such as: physiotherapists, physical trainers, nutritionists and sports psychologists. 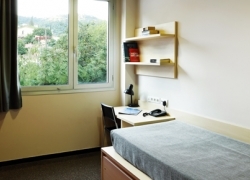 In terms of the common facilities and other services, the residence has a cafeteria, a number of study rooms, a gym, a heated swimming pool, laundry service, and room cleaning service. The academy offers a daily laundry service. Athletes should put their training clothes or street clothes in a red bag and turn them in directly to the laundry room employee. To avoid any confusion, it is very important that all clothing is marked. Breakfast is served in the residence before leaving for the first training session of the day. 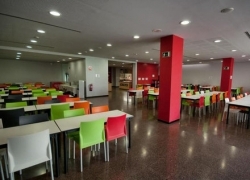 Lunch, snacks and dinner are held in the academy´s cafeteria. 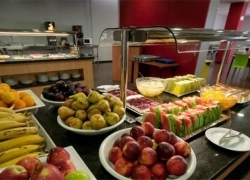 If advised with sufficient notice, the camp can adapt to special dietary requirements, such as a vegan menu, and dairy-free or gluten-free menus. Any requests for a Halal or Kosher menu will be provided at an additional cost. *All transfers outside of the regular service schedule will have an additional cost of €50. *In your quote you will find the price for the standard transfer service. Once we are able to confirm your flight information we will adjust the transfer price as needed.